I feel like it has been forever since I have posted a blog, oh wait...it has!! I have had a lot going on lately! After Adam left Tuscaloosa all of the craziness began! I had to lucky privilege to be the chosen one to take my nephew to get his shots for Kindergarten. He has been in school for a while but had to re-schedule the previous appointment that he had in July because he went to Las Vegas ( I didn't even get to go there until I was 21 years old, and he went when he was 5! LUCKY). So on the day that I took him, I went to his school to check him out, and he asked why I was there and I told him he was going to the doctor so he could check to see if he was growing properly or not. I expected him to immediately fall to pieces and start crying, but surprisingly he got right in the car. I mean, I am 22 years old and I still hate the doctor, so this shocked me. The only request that he had before we went inside was that everything that the doctor had to check, I had to get done first. That's fine. So we go in and get checked in and then they call us to the back. 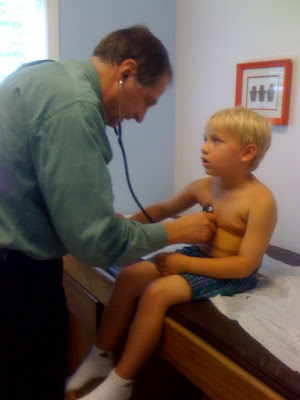 The first thing that the nurse wanted to do was measure the weight and height of him. But wait, I had to go first. So she measured me ( 5'3" thank you very much) and then told me to step on the scale..NO THANK YOU! I said ," that won't be necessary." :) Then Hunter got measure and she weighed him (he weighs a whopping 50 lbs. and he was 3'11" ). After all of that was done we went into the room and did all of the other stuff. This was all interupted by Hunter having to poop, and if you don't know this, he takes FOREVER!!!!! By the time he was done takin care of business my brother had gotten there, so he was the one that broke the news to Hunter about him getting his shots..he was not excited about that at all! He had to get 4 shots, so that's a little more difficult to do when I am the one having to hold him down, but thankfully the nurse was extremely fast and just poked him in both arms and then 2 in one leg. He was fine after they gave him a coupon for free ice cream to TCBY. Then we left!..I think I forgot to mention that the doctor said that he was over weight, which I thought was really funny considering before school started he weighted 55 lbs. so technically he was already losing weight! For the rest of my time in AL I just hung out with my fam and ate extremely too much food. 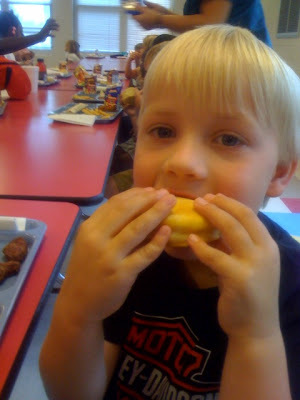 I went and ate lunch with Hunter at school a few times when I was there, so that was fun. One of the other days my Mama and I went to eat at a realllllllllly tasty restaurant called Cypress Inn, it's our favorite. Then after that we went and saw the movie My Best Friends Girl. It has Kate Hudson, Dane Cook, and Jason Biggs in it. It was good but the previews are NOTHING like what the real movie is about! But it was fun to get to hang out with my Mom for the day! I had originally planned to come to FL on the 22nd. But when Adam called me with the big news about going to the Dominican, those plans changed! On Monday the 22nd I went and saw my Dad in Huntsville and we hung out! 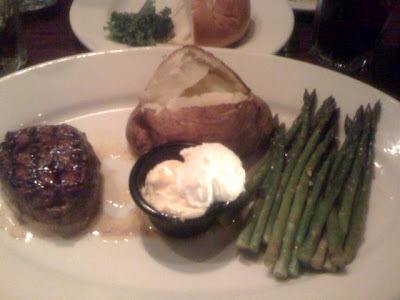 We went to eat at the BEST steak house I have ever been to, and I have been to a lot of steakhouses. It was called Connors, so if you ever see one, I highly suggest that you go and eat their steak!! After we ate he took me shopping, I had to get some more tank tops and stuff since it will be so warm when we are there! ;) After I left my Dads on Tuesday I then went back to Tuscaloosa (it's about 2 1/2 hours from Huntsville to Tuscaloosa) and I had to go back through all of the stuff that I had already packed to bring to FL when we thought we were going to be here for the whole off season. That meant that I had to eliminate over half of the stuff I was bringing, which was good because when I went back through it I realized that I was bringing a ridiculous amount of things that weren't necessary. Then on Wednesday I packed all of my suit cases in my car and left Tuscaloosa and headed to my Aunt Rah Rah's house. 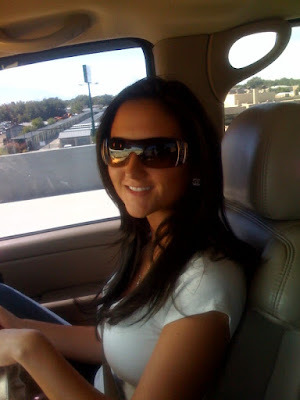 She lives in Mary Esther, FL (near Ft Walton). We went and got pedicures on Thursday, I LOVE getting those! I stayed there until Friday morning. And now I am FINALLY in Sarasota!! During my trip from My Aunts to here I stopped in Tallahassee and saw my Grandparents..it was a quick visit but it was nice to see them! The Alabama vs Georgia game is on tonight so we are just planning on watching that. It is probably one of the biggest games we play all season so it should be a really good game to watch. All of the Georgia fans are calling it "The Blackout" because their team is wearing their black uniforms, which have only ever been worn one other time. Lets just hope that John Parker Wilson can complete his passes, you never know with him! I hope that everyone is doing alright! We will keep everyone posted on our trip to the Dominican!!! We've been waiting for this for a while. My agent call yesterday and told me they received a contract offer from a team in the Dominican Republic, the Licey Tigers. From what I've heard, it's one of the best teams they have and is located in the capital Santo Domingo. We are finalizing the contract and hopefully Lindsay and I will be out there around October 10th. My agent was able to get the team to pay for Lindsay's flight to and from the DR and mine. He is also working on what I'll be paid per month. Whatever number we finalize on isn't too important, I'm just glad to get the chance to go play in the best league and for the best team. The season starts on the 15th and runs through January. We will probably come home Christmas time. I hope to go down there and get some more at bats and play well, getting myself ready for next year. If I do well it could show some of the major league teams that I am ready for a shot in the big leagues. If I don't, I could be home within a week of getting out there. Here is a nice little look at baseball in the Dominican, make sure you click on all three parts, click here. Lindsay is trying to get down here by the end of this week. Just in time for her to help me move out of the house that I just moved into. I was in the process of getting hired on at the IMG academy as a part time baseball coach like I was last year but I'm going to have to back out of that. I'm still hoping to be able to workout over there and get ready for winter ball. 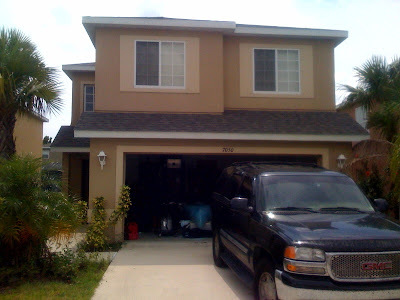 Other than that it sure does feel good to be back in Florida and hanging out with some of my old friends. I made the drive from Tuscaloosa to Sarasota today in about 10 hours, not bad compared to the driving Lindsay and I did going across the country. It sure does feel good to finally be home. I'm also glad to know that one of my friends has two empty bedrooms in his house, so it looks like I found my off season home. I've been really lucky to find great places to stay every winter, its never been too much of a hassle. I'm going to spend most of tomorrow moving in and getting settled down. I have to make a few phone calls to IMG ( the training facility where I worked out at last off season ), my agent, to talk about winter ball, and a few others. I still haven't heard anything on winter ball and I'm getting a feeling that it might not happen this year... we'll see. I had to rush a little bit this morning, leaving around 6:30am because at 7:00pm was my first off season softball game. I was invited to play, for the second year in a row, on a company softball team. Two of my buddies work for the same company and got me in there with them. We won while I went 3 for 3 with a home run, double, and single. Mostly its all good fun out there but some of the guys take it pretty seriously. Its pretty funny how nervous I was through the first few innings. I haven't really had that feeling during any of my regular season baseball games except for opening night and here I am with a bunch of middle age men, most with beer bellies, nervous trying not to make any errors. I feel like I have this big expectation to play lights out because everyone on our team knows that I play ball professionally. 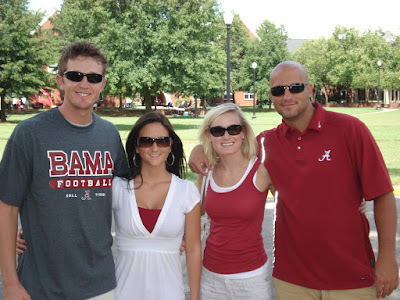 Our time in Tuscaloosa was great. We went to the football game on Saturday night with Lindsay's dad and her brother Robby. We got to tailgate and see some of my old baseball friends. I got to meet and spent some time with a lot of Lindsay's family. They're great. We got to eat some really good food that I can't get anywhere else but Tuscaloosa. It was definitely a nice trip. 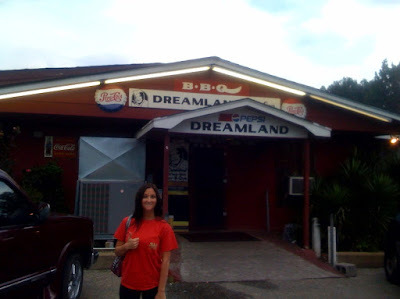 Dreamland BBQ has the best ribs I've ever had. There is nothing special or fancy about their restaurant except for the RIBS and sauce are the best. 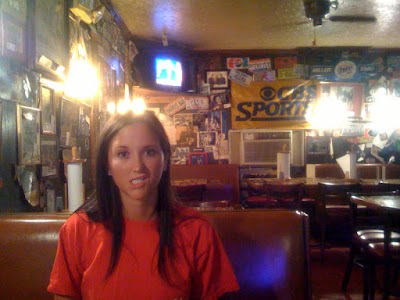 Lindsay has a funny knack for making goofy faces every time I try and take a picture of her. Well...the season is over! .280 batting average, 22 home runs, 80 RBI's, and the team won the division for the third time in a row. By far my best season professionally ever. I wish we were still in the playoffs but we got beat by the Sacramento Rivercats( Oakland A's triple-A) in the first round. 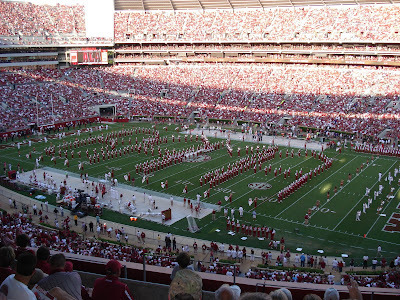 Oh well... Just means we get to make that Sept. 13th Alabama football game in Tuscaloosa. Lindsay's dad has season tickets so we get to go!!!!!!!!!!! We can't wait. We packed the house up on Sunday night and left Salt Lake City on Monday morning. The drive is around 30 hours total with construction, traffic, and stops. We stopped just outside of Lincoln, NE the first night and today we continued the drive and made it to Memphis where we are stopping for the night before finishing up the remaining four hours tomorrow. The drive has been better than I thought with Lindsay leading the way and I'd call her every now and then with directions and stops. She was a trooper yesterday, driving a total of 15 1/2 hours! Once we finally get to Bama we are going to stay with Lindsay's brother for the week. He has a big new house all to himself so there is plenty of room. That means that Lindsay will get to see her nephew, Hunter, every night. We don't have any big plans while we are there except for a big lunch at Lindsay's Grandparents house on Friday and then tailgating and football ALL day Saturday!! Lindsay dyed her hair before we left SLC. It is amazing. She has never dyed it this dark before, it is almost black ( dark chocolate, to be exact ). She freaked out about it at first but after a day or two she is finally used to it. Everybody in Salt Lake loved it! I should be back in Florida on Monday night.